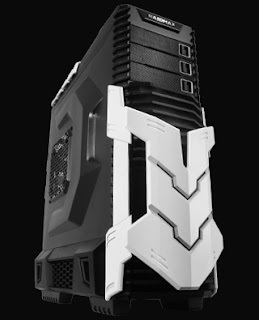 March 15, 2012, L.A., California, U.S.A. - RAIDMAX, a computer chassis provider, is pleased to announce a Gundam themed chassis with an unique HDD storage design. Designed for ATX and m-ATX motherboards, the AGUSTA is ideal for gamers seeking an aesthetically striking chassis with numerous tool-less features and impressive cooling. In front of the five 5.25” bays with pop-off panels is the Gundam themed armor-shield. Opening like a door, this front shield gives the AGUSTA a visually striking appearance. When complemented by the front and top LED illuminated fans, the AGUSTA adds unmatched flash and appeal to your system. The upper compartment holds all your essential hardware including, the motherboard, power supply, two 2.5” SSDs, and up to five 5.25” drives. With the HDDs out of the way, the AGUSTA can house the longest VGA cards on the market. Future expandability is not a problem with the seven PCI slots, and the RAIDMAX AGUSTA even supports water-cooling with three rubber protected holes on the back panel. Located underneath the main compartment, the HDD bay supports up to six 3.5” or 2.5” HDDs. The HDD bay is easily accessible from both sides. With a simple pinch of the access tabs the honeycombed bottom side panel opens. The HDD trays tool-lessly slide out, allowing users to easily screw their HDD or SSD into the tray. Rubber protected holes on the ceiling of the drive bay makes it easy to connect all the wires to the motherboard in the upper compartment. With the separation of the HDD bay and seven fans in total, the AGUSTA is guaranteed to keep your system cool. The front 120mm LED illuminated fan is specially designed to blow directly on the VGA card. More fans helping to circulate air unobstructed through the top compartment include: dual top 120mm LED illuminated fans and a rear 120mm fan. In the bottom compartment, which solely houses the HDD bays, one front 80mm and two rear 80mm fans ensure optimal running temperatures for your HDDs and SSDs. Adding even more cooling capabilities, the honeycombed ventilation design on the bottom compartment and the stylish ventilation area on the tool-lessly removable side panel lets excess heat easily escape. Out of the box, the AGUSTA provides pre-routed cable management for all the fans, LEDs, USBs, and audio connections. For your other wires, rubber protected holes let you guide all the cables to the roomy 25mm space behind the motherboard keeping your system neat and organized. Equipped with the standard USB 3.0, USB 2.0 slots, audio and microphone connections, the AGUSTA's I/O panel, located at the top of the chassis, also comes with two control knobs allowing you to adjust fan speed and LED brightness.